Appliances have protective insulated cords and coverings to keep you from contacting the electricity inside. 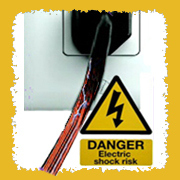 If the cord insulation or the appliance covering becomes damaged in any way so that a live wire inside an appliance, toy, or power tool touches the inside of the device and you touch the device, it is like touching a bare live wire. Use appliances and cords the way they are designed to be used so you don't damage the insulation or contact live electrical parts. You cannot tell from the outside if there is a problem inside, so you should always act as if there is danger of shock. Always report a damaged cord or appliance to an adult.